Quarkspace & Matt Howarth - "Node in Peril"
The latest from Quarkspace is billed as a collaboration with comic artist Matt Howarth. The music is all Quarkspace, but along with it is a 16 page CD sized comic book by Howarth that provides the story and theme that the music is a soundtrack for. 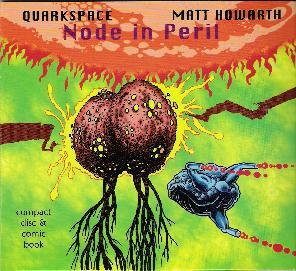 Howarth has long had his hands in the space and prog rock world, having featured the likes of Hawkwind, Ash Ra Tempel, Klaus Schulze, The Residents, Richard Pinhas, and many others in his comics, created the artwork for album covers, and done similar album-comic collaborations like Node In Peril. The music for Node in Peril was selected from among the all improvised, instrumental Spacefolds sessions, the main difference being that for this project the musicians allowed overdubs to achieve their goals. The music is trademark Quarkspace, chock full of soaring synth waves and guitar notes that wrap themselves around your brain. These guys excel at combining a killer jamming quality with a clear sense of direction and thematic development. Some of my favorite moments are when Jay Swanson's piano plays the lead melody while the bass and drums provide the driving backbone, and guitar and synths inject the high octane cosmic factor. The nearly 14 minute "Waking The Beast" is a highlight in this regard. Stan Lyon's guitar style couldn't be more different from the departed Dave Wexler, working very much in cooperation with the keyboards and synths for color and character formation. "Signal-to-Noise Ratio Error" is a track that jumped out at me, particularly because the bell styled melody brings to mind a heavier and spacier version of Goblin's Suspiria theme. And "Entering Node 817" has a heavy driving pulse that recalls the title track to Pink Floyd's Obscured By Clouds. Quarkspace long ago established their own recognizable sound, though reference points for the uninitiated would be a spacier and trippier version of Ozric Tentacles and elements of Pink Floyd. A number of reviewers throw in Hawkwind but I don't hear it. And though very much a space rock band, Quarkspace has much to offer the prog rock fan. In any event, Node in Peril is a must for fans of Quarkspace's Spacefolds series, though the music, as intended, definitely flows much more smoothly from beginning to end. And there's a small note in the CD jacket that says "optimized for headphones listening". Trust them on that. Contact via snail mail c/o Eternity's Jest Records; PMB 212; 1799 W. Fifth Ave; Columbus, OH 43212.